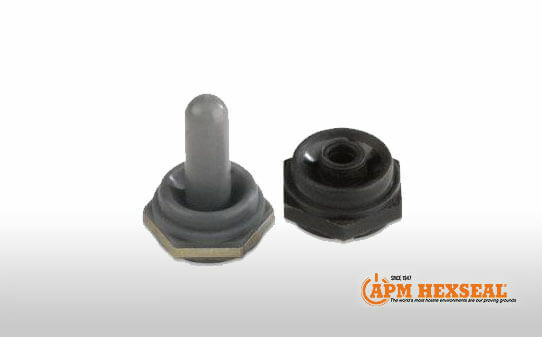 APM Hexseal: Avoid Unintentionally Tripping a Sensitive Breaker/Wwitch » HHP Associates, Inc.
Avoid unintentionally tripping a sensitive breaker/switch into the on/off position by attaching the patented APM Hexseal 1131/60 or 1132/60 inverted bellows toggle switch boot. There are an increasing number of breaker/switches that when covered with an environmental sealing switch cover can trip the breaker/switch into the off/on position due to the mere physics of being covered by the wrong type of cover. Our “Ultra Flex Series” with a bellows design incorporated therein is very able to combat this problem!